This summer sees the publication of two new special features on encampments and occupations in South Atlantic Quarterly and Social Movement Studies. Protest Camps’ had the opportunity to contribute to both of these great collections and recommends them to all those reflecting on these recent movements. In December 2011, Protest Camps’ Anna Feigenbaum helped Emma Dowling run an open workshop at Occupy LSX reflecting on some of the successes and challenges of the movement. With Susan Pell and Katherine Stanley from Tent City University, they put together a short piece arising from these discussions and their own experiences at the camp. Their collective reflections are now published in the special segment ‘Encampments and Occupations’ out in the Summer 2012 issue of South Atlantic Quarterly (111:3). The issue also features reflections on Tahrir Square, M15 and Occupy Wall Street, as well as an introductory note by journal editor and prominent social movement theorist Michael Hardt. You can read the abstract below and download the full article (with uni access*) from South Atlantic Quarterly. 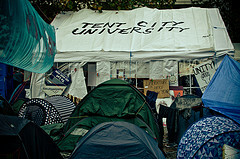 This essay brings together the authors’ experiences and observations with reflections gathered in an open workshop about Occupy London organized under the banner of the Tent City University working group.The essay posits Occupy London not as one entity but as an organizing process located in more than one area within the City of London. They see Occupy London as both a powerful idea and as a material practice. The authors reflect on the social composition, organizational politics, and infrastructure of Occupy London. They conclude that, aside from the challenges of collective organization and the desire to maintain visibility, one recurring concern within the Occupy London movement is how its embodied practices of struggle can emanate from centralized and often symbolic moments into the everyday realms of production and reproduction within society. A special issue of Social Movement Studies also comes out this month, featuring reflections on Occupy Wall Street, M15, Tahrir, Israel and more. The double edition, edited by Jenny Pickerill and colleagues, includes some much welcomed further analyses looking at questions around homelessness, colonialism, nationalism and historical legacies as they relate to and shape contemporary mobilisations. For their contribution, Protest Camps’ offers an engaging review of n+1’s new book Occupy! 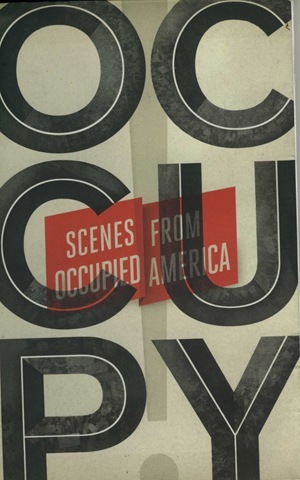 Scenes from Occupied America released by Verso. *If you don’t have access to these journal articles and would like to read these pieces, you can get in touch with anna [at] protestcamps [dot] org. Free access is now available to the special issue of Social Movement Studies on 'Occupy!'. Volume 11 Issue 3 is dedicated to reflections on the movement. The papers are listed below, and to get access simply; - Visit: www.tandfonline.com/r/csms-access - Log in with account details from a previous visit, or spare 2 minutes to register. - Sit back, relax, and enjoy reading!